Got a burning idea to share on the TEDxMiddlebury stage? Every year, we have one student speaker who gives a TEDxMiddlebury talk alongside all our guest speakers. The Student Speaker Competition will take place on October 4, 2018 @ 7:30pm in AXN232. We invite all students to enter in the competition. At the competition, students will share a four minute speech of a topic which they are passionate about that is related to this year’s theme. 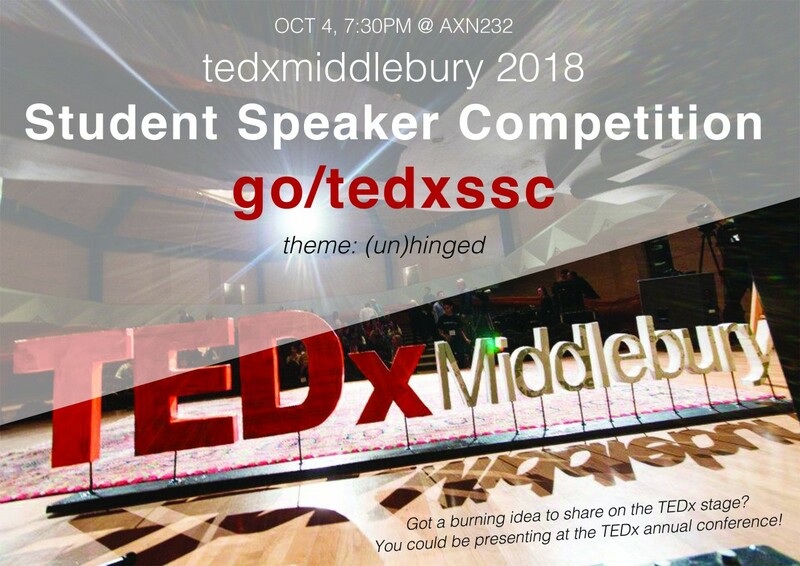 A panel of faculty judges will elect the winner, who will give a full, 18-minute presentation at the 2018 TEDxMiddlebury event. This year’s theme, “(Un)hinged”, is about exploring the fine line between stability and crisis, of routine and innovation, and of chaos and order, all of which often exist in flux if not in parallel. Topics will vary in scale, but signal a turning point in one’s life. (Un)hinged tests the boundaries of our ties to ourselves, each other, and our collective identities; much of our daily lives are shaped through interactions with each other and the world around us. (Un)hinged gives us the space to find the balance between our past and present, our dreams and nightmares, our built and natural environments, and progress and nostalgia. If you have any questions, please feel free to email us at tedx@middlebury.edu. We are looking forward to your applications! And again, all students are invited to apply!